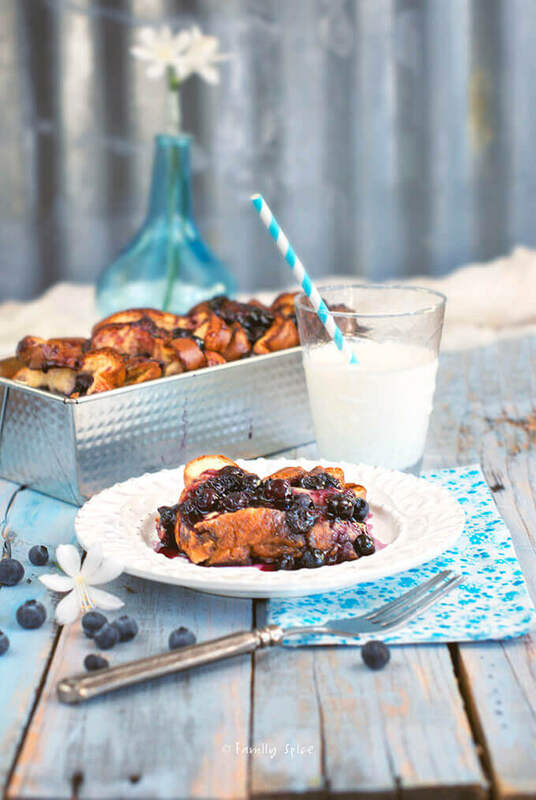 Perfect for brunch or any lazy Sunday morning breakfast, this Baked French Toast with Blueberries is moist inside, bursting with blueberries with a crunchy crust. Sponsored by Davidson’s Safest Choice Eggs™. One of the first breakfast foods I perfected as a kid was making french toast. It was super easy. Scramble some eggs, dip the toast, cook it in a hot pan. BOOM! Breakfast is served. I was so proud of myself for making such a decadent meal. Between pancakes, waffles, crepes and french toast I was always infatuated with french toast. My kids, though, they like my pancakes and chocolate chip waffles. So, needless to say, I don’t get to make french toast in my house often, unless I am making it for myself. Which isn’t a bad thing, except I really don’t let myself indulge in french toast everyday. My hubby, he has a sweet tooth, especially for breakfast. And not in a good way. He’s happy with a slice of pound cake, a danish, a doughnut or cookies with his morning coffee. “What? What’s wrong with that?” replies the man who never had to go on a diet his whole entire life. AARGH!!!!! I usually just throw my arms up in the air declaring defeat. After 14 years of marriage, I recognize when it’s futile to fight the fight. My typical breakfast is simple: yogurt, fruit and granola or a protein bar or eggs. But today, I’m sharing with you what I would love to eat every morning, my secret love: french toast. 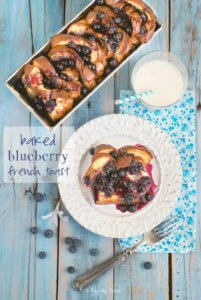 And for those of you who have family and friends that love french toast for breakfast, this is the recipe for you. I personally like it moist on the inside and crunchy outside. So that’s why this baked french toast is upright in a loaf pan, instead of flat in a pyrex. And since I used pasteurized eggs from Davidson’s Safest Choice Eggs™, I don’t have to worry about salmonella. It will feed about 7 or 8, depending on how many pieces of toast and blueberries you can cram into your loaf pan. And did I mention this thing is jam packed with blueberries? A whole lotta blueberries, as my post title says it?! I also drizzled this bad boy with some quick blueberry syrup, too, because I really can’t get enough of those blue jewels. Coat a 4" x 10" loaf pan with nonstick spray. Once each slice is coated with batter place into prepared loaf pan. Continue until all of the bread is in the pan. Cover with foil and chill french toast in the refrigerator for two hours or up to overnight. Bake french toast covered for 40 minutes. Remove the foil top and continue baking for 20 more minutes. Cook until blueberries are soft and burst, about 15 minutes. Serve with the warm french toast. Disclosure: As I am part of the Darling Dozen, I did receive a stipend from Davidson’s Safest Choice Eggs™ to develop a breakfast recipe using their product. The story I have written is all true, and the opinions are truly mine. If I didn’t like it, I wouldn’t blog about it! I’ve been mentioning pasteurized eggs for ages even though my blog is totally noncommercial simply because I think the product makes sense. It’s rare that one gets ill from eggs, but it does happen. And I don’t know about you, but I find it impossible to make cookies without tasting the dough! Which of course usually has raw egg. Same deal with French Toast batter – I always taste it to see if there’s something it needs. Speaking of French Toast 😉 yours looks excellent! I like soft center, crispy top too, so your method is perfect. And I love all the blueberries! Good stuff – thanks. Love your baked French Toast, this would make a perfect weekend breakfast! 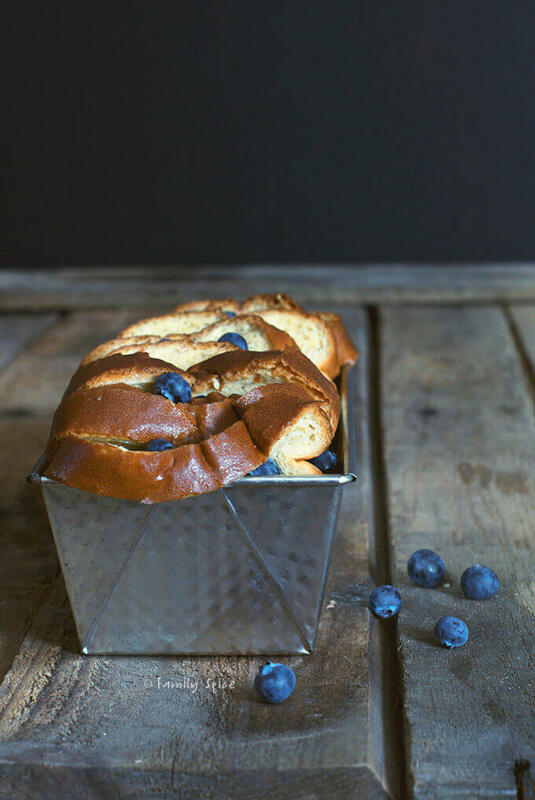 Gorgeous recipe… sounds like a bread and butter pud of sorts, with blueberries… one of my favourite fruits. Found your blog via Manuela, and so glad I did! This is truly a sumptuous decadent dish which looks spectacular. My grandmother used to make French toast but I never do. This looks good enough to convert me though. beautiful ! love this wholesome version. Thinking of making it with gluten free bread !! I am the sweet tooth person at home but I try healthy sweet treats & this is def on my list !! Love the fresh new look on your blog !! 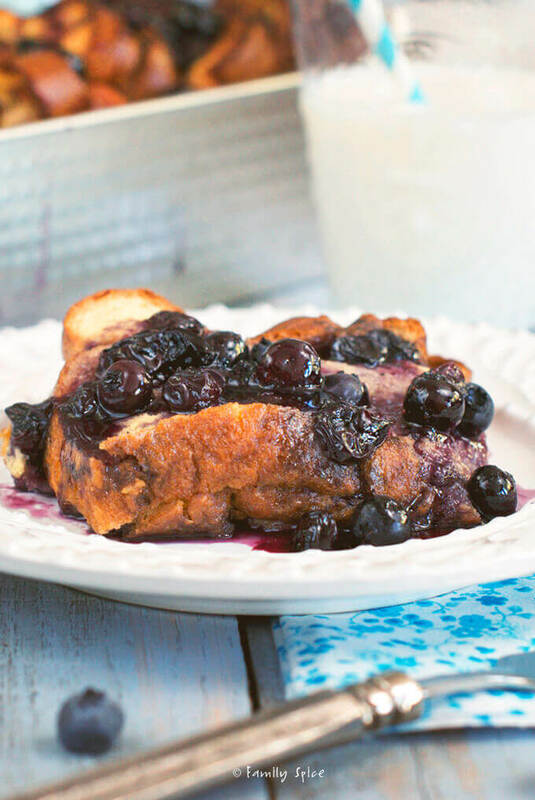 I used my high fiber whole wheat bread for this french toast to keep it semi-healthy! Um, I did polish this myself! These kids don’t know what they are missing! I adore blueberries. I am a fiend for French Toast. I can’t wait to make this! Thanks! What’s not to adore? I hope you do make it – enjoy! G’day! Love your photo and your baked recipe! Who could go for some of this RIGHT now? ME!! Great entertaining dish for brekkie! Paula, I totally drowned it with blueberries. No such as thing as too many blueberries, right?! 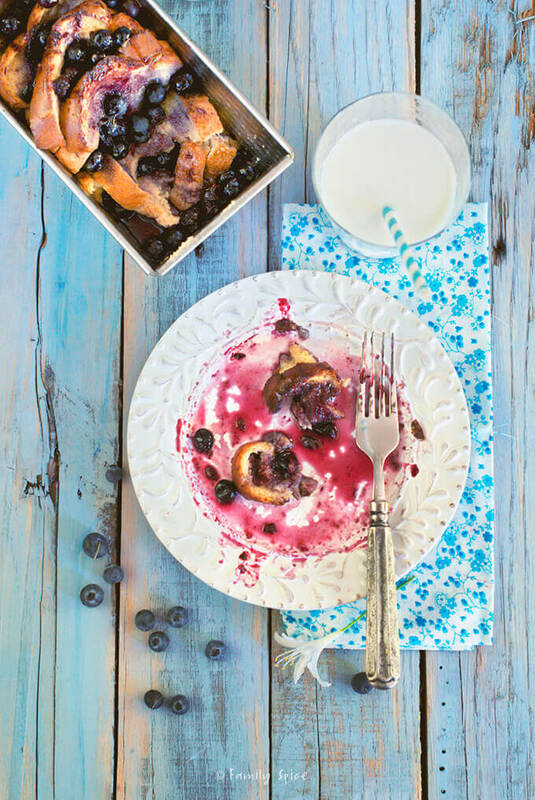 Oh my word… all those blueberries have me swooning like a school girl! Love this! this looks soooooooooooooo good. love your photos… my husband is the opposite, he loves savory for breakfast, i can do either one. i’ve seen ina make her baked french toast.. it’s been on my list for too long. did you use whole wheat toast or challah bread here? I used whole wheat toast. Some the pieces were a little folded so maybe that’s why it looks thicker. It’s easy to make, so I hope you try it! I love that you put abundant blueberries in here… they are so expensive in Japan and I’ve been craving it every single day. When I go back, I think I’ll live off with blueberries for a while. I’m craving that much. Crazily. This looks so delicious!